Welcome to your February update from Hearing Link - we hope you enjoy our stories. Please feel free to forward this onto your family, friends or colleagues. If you would like to contribute any stories, news or information for a future update, please email our Communications team. Our LinkUp group experiences in 2018 proved to be positive and life changing for participants. The weekend, residential format gave people a really good chance to get to know each other well and to gain the right support in a safe environment. We delivered six groups across all areas of the UK to over 70 people affected by hearing loss, including family members and friends. Another participant said the “Personal stories really resonated” and also expressed her relief that the weekend “Covered everything I wanted, whilst feeling relaxed and not too regimented”. Monday (4th February) marks the start of Tinnitus Awareness Week 2019. Organised by the British Tinnitus Association , the week which runs until 10th February aims to raise awareness of tinnitus and the impact it can have on day-to-day life. 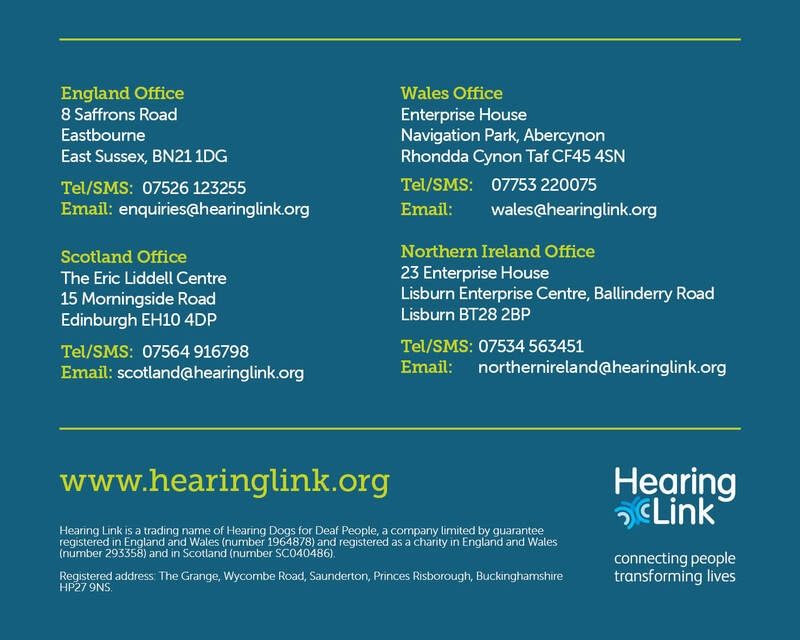 Alternatively, contact our Helpdesk for support by emailing helpdesk@hearinglink.org or Tel/Text: 07526 123255. Hearing Link volunteer Ann Thallon joined other groups and organisations at a recent hearing awareness day in Kirkcaldy. Organised by the Royal Victoria Hospital, it was a chance to make others aware of the support and services offered by Hearing Link, and to answer general questions about hearing and hearing loss. We recently held our final volunteer training event of 2018 in Edinburgh looking at Media & PR. Volunteers Mel and James share their adventures about travelling to and taking part in this event. Read their full story on our website. Our volunteer Bob Gowan shares his experiences of working as a contractor in the construction industry and discusses the difficulties for some working in that environment. Read his blog. Our Northern Ireland team were out and about raising awareness recently at the Hear for the Holidays event in Belfast and had a brush with local law enforcement too! Nuala Muldoon, our Northern Ireland Manager, was speaking to guests at the event, run by our friends at Action on Hearing Loss, about Hearing Link services, the support we offer to individuals and their families with hearing loss and the types of equipment that can support them day to day. It was also a chance to network with others including PC Johnny Hamill and his colleague who are involved in the PLOD scheme (Police Link Officer for Deaf people). PLOD aims to make criminal justice more accessible for anyone with hearing loss. Our membership scheme has been completely reviewed and our new scheme will be available for subscription from 1st April 2019. Membership is your opportunity to join with us in a meaningful way to help improve the experience of living with hearing loss for individuals, families and communities. As a bonus, membership connects you more directly with the Hearing Link and Hearing Dogs communities, includes discount on some of our shop items, and will offer the opportunity to be involved in focus groups and forums (new for 2019). Forth Valley Sensory Centre annual tinnitus day - The Forth Valley Sensory Centre is hosting its annual tinnitus informationday on the 5th February. Visitors will be able to drop-in for advice sessions and workshops for those wishing to find out more about tinnitus and how to manage the condition. Read more. Taunton Hard of Hearing Group - The Taunton Hard of Hearing Group is encouraging new members to come along to its monthly club. Join members on the third Thursday of every month from 2-4pm. Find out more. Banbridge group awarded funding - Congratulations to our affiliated group and club – Banbridge Lipreading Group – for successfully obtaining funding to run lipreading classes in 2019. Read the full story. 6 tips to protect your hearing - Protecting your hearing is possible, particularly if you remain vigilant about the situations where your hearing could be most at risk. Read the full guide from Best Hearing Health. Places left on beginners lipreading course - There’s still time for you to join a free two-year beginners course in lipreading in Edinburgh. Book your place. Experiences sought from students with hearing loss - Glasgow Caledonian University student, Laura Aitken is conducting research to investigate perceived attitudes that deaf students face from hearing students, and how these perceived attitudes. Take part. FREE managing your hearing loss course - A new and free six-week managing your hearing loss course will take place in Edinburgh from Saturday 23rd February until 30th March 2019. Find out more. Click here to unsubscribe from our e-newsletter.